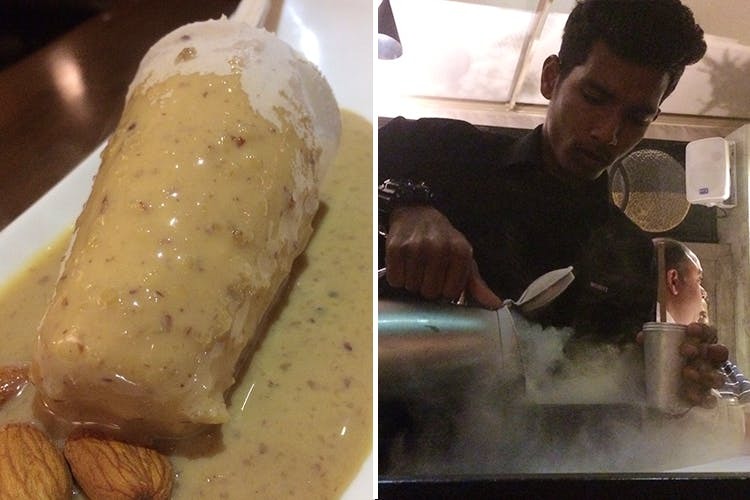 The boozy kulfi at Myx has foodie tongues in Mumbai wagging for all the right reasons, so we decided to check it out. We had heard a lot about the Irish kulfi at Myx so we decided to take the plunge to travel to Juhu just to see what the fuss is about. The Irish Kulfi comes at a price tag of INR 300 but justifies with the shebang that comes with it. It won’t be served to you right away. A trolley will come with all the ingredients perched on top of it. The server will tell you how it’s made and what goes in it. It’s condensed milk, coffee liquer and Bailey’s frozen with liquid nitrogen – right in front of you. It takes minutes to get made and the procedure feels like a magic show. We were requested by the server to relish it slowly. The taste was fantastic with a strong coffee liquer flavour hitting our nose with every bite. The hit was equivalent to the amount you get after one drink. If you’re torn between choices for a date, Myx is a great option. Their music is played at just the right volume so you don’t have to go over the table to hear the other person.